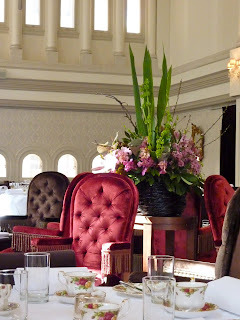 The High Tea Inspectors: The Tea Room, QVB, Sydney, N.S.W. Shopping in the famous QVB and high tea - the ultimate indulgence! Well we had the works, Royal Albert Tea set, starched white table cloth and excellent and attentive service - all the makings of a wonderful morning tea. 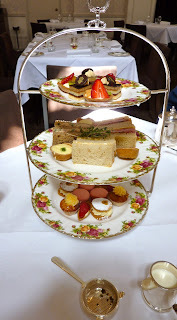 Our choice was The Morning Tea - an array of cakes, pastries and finger sandwiches served with tea or coffee. My tea selection was the aptly named "Splendid Earl Grey". The food and tea were the perfect compliment to the wonderful room, a beautiful and fitting environment to celebrate a sister's birthday (the big 60!). Even the lift to the third floor puts you in the right frame of mind for a bit of Olde Worlde charm. We spent a relaxing time indulging in one a life's truly great pleasures, conversation over a stylish pot of tea. Anytime you're in Sydney and need to find the right ambience to just to sit and ponder I highly recommend The Tea Room - hard to fault! Ahh well it's off to Angleterre for you my dear!!!! I have reviewed a couple in Angleterre (had to look in Wikipedia for that one). Actually that is what got me started. This is like my photography a lot of fun, find something positive and enjoy yourself.